All-On-4 is right for anyone in relatively good health who already wears dentures or may need to wear them soon. The benefits of All-On-4 in comparison to traditional dentures are numerous and significant. Patients receive a fitted, full-arch prosthesis on the same day as their surgery. The process for All-On-4 is less complex than traditional dentures, thus reducing your time on the operating table. There is no need for return visits because all of the fitting happens in one visit. You can have function, speech, aesthetics, and your self-esteem back all in the same day. In the All-On-4 procedure, 4 implants secure prostheses onto the maxilla and mandible (the upper and lower jaw bone) where bone is denser and stronger. This provides superior stability for denture wearers. By eliminating denture movement and soreness, the fear of embarrassing denture release in public is also eliminated. Many patients find they have 70 percent or more of their original bite force restored, allowing them to eat any food they desire. In the past, significant bone loss in the jaw limited suitability for dentures in certain patients. However, All-On-4 expands the eligibility requirements because the process secures the prosthetic on the strongest part of the mandible and maxilla bone. 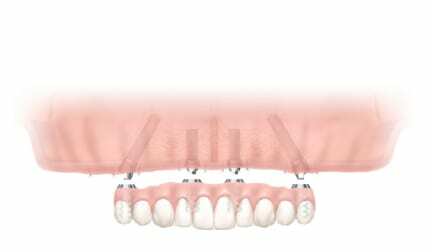 Additionally, the NobelProcera Implant Bridge and NobelProcera Crowns make replacing a single tooth or multiple teeth an option, rather than pulling teeth for full dentures. Cleaning your All-On-4 is just like brushing regular teeth. There is no adhesive needed, and they do not need to be removed and soaked. NobelClinician software provides predictable implant placement with diagnostics and planning. This begins with intricate planning before surgery. 3D models and radiographic guides are used together to assess the quality and density of available bone. The alveolar nerve and maxillary sinus are identified, so the prosthetic is fitted without limitations. After this prep work, surgical templates help create a prototype that allows a dental technician to produce an abutment placement jig and fixed prosthesis. This shortens surgery time because clinicians only need to mount the prosthesis and make minor adjustments. Fewer implants are used for All-On-4 than in traditional implant restoration. This benefits the patient by making them more cost effective. Fewer implants means less surgery time, a smaller healing area, and a less invasive experience. With the average life expectancy increasing, more and more people need dental support. If you wear dentures or need dentures soon, talk to Oral and Maxillofacial Surgery Nashville about All-On-4 and how they could benefit you.